Location:. 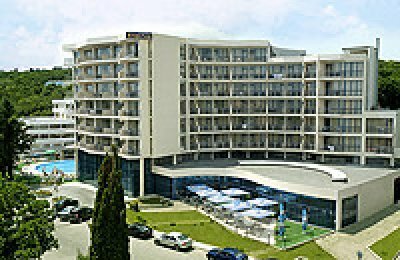 Hotel “Elena” has been built in 2004 and is located in the southern, still not covered with constructions, side of Golden Sands, just some 180 m from the sea shore and in immediate vicinity to the main attraction centres and main shopping street. 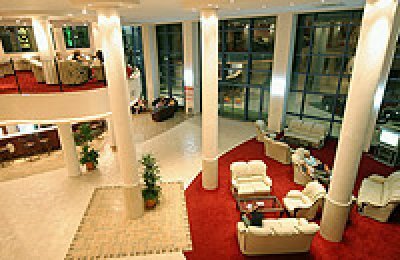 The hotel is placed in quit and calm area with preserved green vegetation and incredible panorama to the sea. 17 studios allowing for accommodation of up to 3 persons with 2 children. The rooms are offered with park or seaside view. All rooms and studios in the hotel have refrigerator, telephone, satellite TV, air-conditioning, safe boxes, stretching chair and balcony, spacious baths with shower cubicle, or bath tube and hair drier. Restaurant with 220 places and open-air terrace with 80 places, lobby bar, cocktail bar in the mezzanine, pool-bar, outside and inside pools, spa, 24 hours medical cabinet, fitness hall, sauna, steam bath, Internet, hairdresser and cosmetic beauty salon, shops.